MAJESTIC harmonies overwhelm the fashionable audience gathered to hear the great composition; the musicians are thrilled by the power of their concerted work; the conductor has forgotten himself in the ecstasy of power he holds over the minds and hearts of those present in the hall. It is a musical triumph. This is the new “music by colors” which has been performed in connection with orchestral performances during the past season. An instrument which produces musical color” instead of sound received its first trial recently in New York, when it was used by the Russian Symphony Society in the production of “Prometheus” by Scriabine, the late Russian composer, who has written into the score of this symphony a part for the color organ or “clavier a lumieres”. Other productions have been given elsewhere in the country, and all have aroused considerable interest. The theory of color music is that the seven primary colors form the basis for a scale and can be wrought into artistic effects harmonizing with music. Scriabine’s dream was to build a palatial theater so contrived that the audience should be bathed in rhythmical light as it listened to music. The medium of the color effect when it received its first trial was two series of gauze strips about eight feet by ten, hung at the back of the stage ten feet from the floor. As soon as the music began, this gauze rectangle became animated by flowing and blending colors of every variety. These colors were “played” by a keyboard with fifteen keys, following a written score. The entire house was darkened and the orchestra played by dark lamps on the music racks. The audience centered its attention on the colors and listened to the music, thus receiving two sensory interpretations of the piece—by sound and by light. These keys are arranged like those on a standard piano, with each octave divided into 9 white keys and the 6 black keys, thus giving the instrument the appearance of a foreshortened piano. Each key when pressed down closes a circuit which, after closing a relay, lights a lamp responding to the desired color, and the color is diffused in the gauze screen. At the same time two pedals and a rheostat control the intensity of the hues. The analogy of color harmony to music harmony affords an easy method of explaining the relations of color to color and shade to tint. As in music where sounds differ in pitch, loudness, and quality, colors differ in three similar respects, which have been termed hue, shade, and tint. 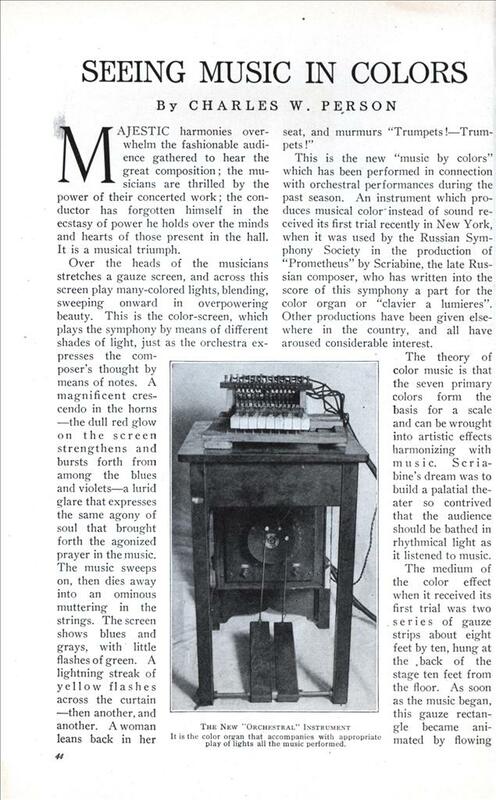 A “color” score that transforms the musical ideas into ideas expressed by light, is prepared, using the light qualities that correspond to sound qualities, and the double “concert” is ready. Following is the chromatic scale of an octave on the piano and Scriabine’s allotment of colors for scoring the “light symphony” that accompanies the music.